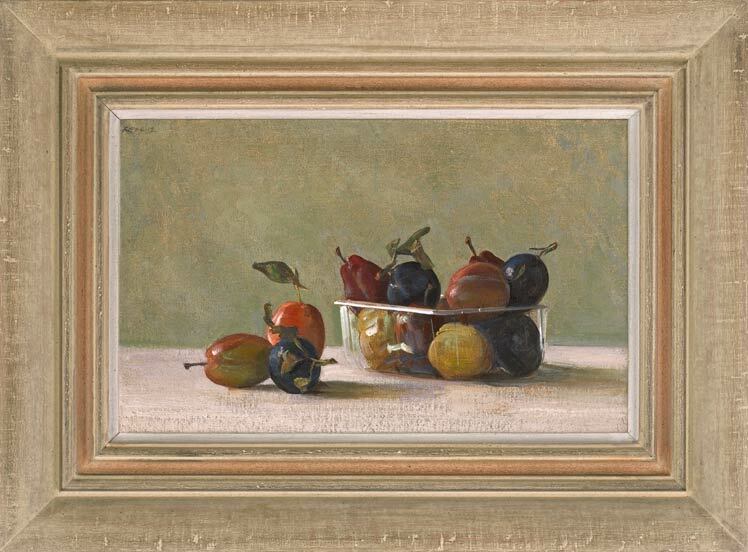 A celebration of a very English fruit: Victoria plums, damsons and golden plums, each acting as a foil to the others in a subtly-choreographed dance of colour, offset by the background tones of onyx and pale warm marble. The clear plastic box, suggested by almost solely by the bravura highlights, is one of Rose’s cleverest modernizings of the ephemeral containers of earlier still life paintings – the earthenware pots in a Velasquez, the wooden cheese boxes in a Melendez, the rush baskets in a Chardin. This is a virtuoso updating of an ancient genre.